Apparently there has been some demand for Joe Toth to develop a two-piece race splitter, that is more aggressive than his one-piece design and can be quickly removed for trailer loading-unloading. 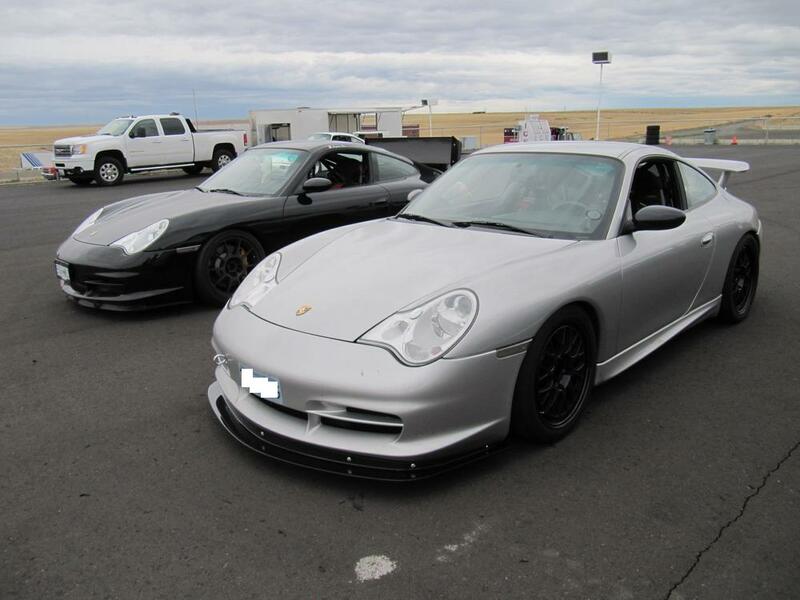 Well I just got back from testing Joe's new prototype splitter at Oregon Raceway Park. I'm very happy with it. Installation took all of two minutes. 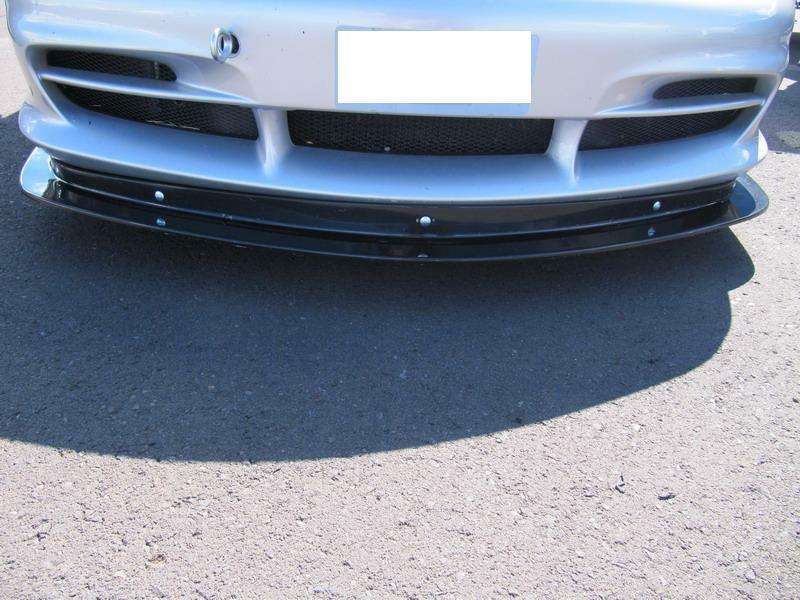 He designed the top section of the splitter to ride a bit forward on the bumper, which eliminates air from getting between the splitter and bumper. I didn't need to use any double sided tape for my install, but I'm still using the well nuts and screws as discussed in another thread by Mikelly (I am using 3/8" (hole diameter) well nut inserts (10-32 screw thread)). Since the splitter is fg (i.e. 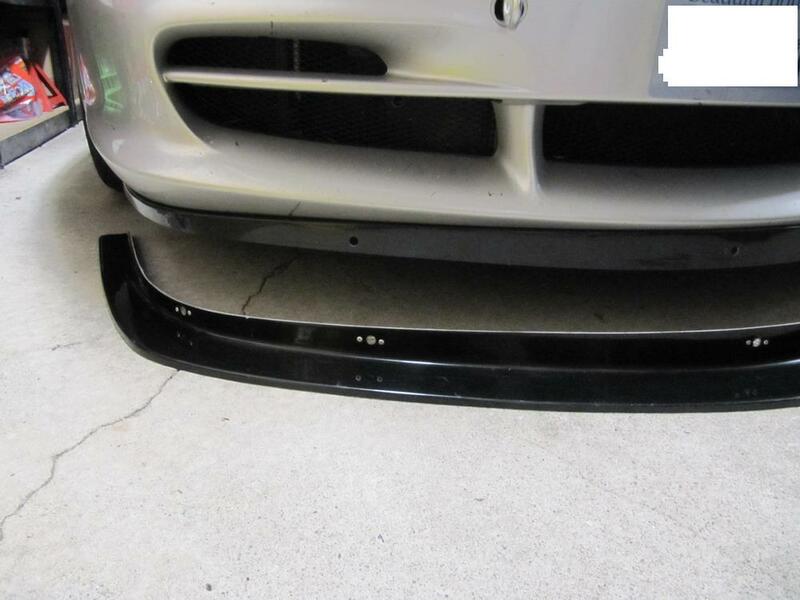 weaker than your bumper), this is a superior solution than using the OEM plastic fasteners, and won't result in bumper damage if you hit a curb. Joe says if I do hit something and damage the lower blade, he'll sell just that section instead of me needing to buy the whole thing. For street driving, I'll be running with only the top piece in place. It looks clean and similar to a stock splitter (aside from the holes in it for the bottom blade fasteners), and there's plenty of ground clearance for street driving. Loading onto my trailer was not a problem, and I can use a steeper ramp angle than when running Joe's 1-piece splitter. Installing the lower splitter blade is accomplished with 7 Dzus fasteners. The bottom blade slides up and behind the top section, and takes a matter of seconds to install or remove. With the lower blade in place it turns into an aggressive and functional race splitter. 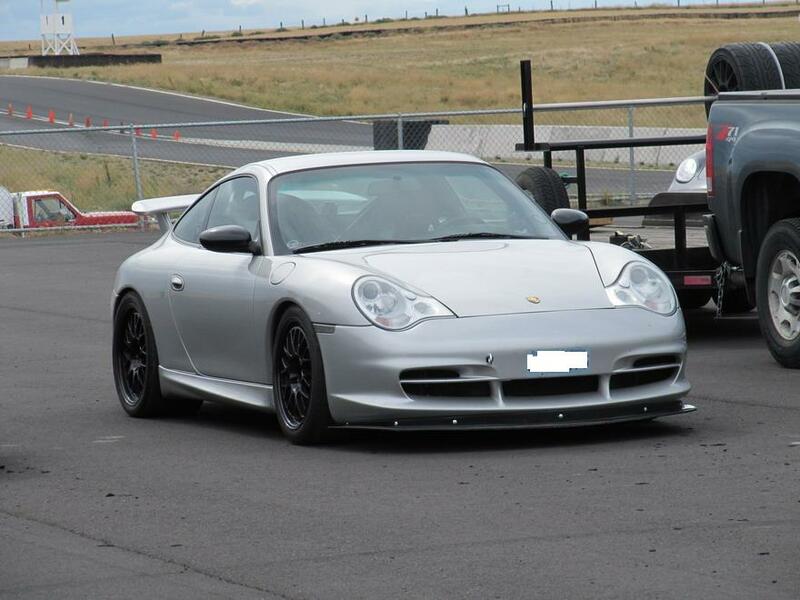 I was happy with it's performance on-track. We ran ORP in both directions over two days, and I set my personal best laptimes in both directions. My seat of the pants impression was that the car felt more stable and planted in the higher speed corners than it did when I used to run a Cup splitter. I think the improvements would be even more pronounced at a higher speed track, or if running a lower ride height. Below are some photos. As per my previous thread about Joe's 1-piece splitter, please do not send me any PM's asking about price or shipping. I have no idea, I'm just helping Joe out by providing a bumper for creating his mold, and as a testing guinea pig. Last edited by IanM; 09-20-2013 at 11:44 AM. Will buy one if price is right. Ditto. Ready to do this if pricing is reasonable. How much, how much, how much?!! Please let me know on price as I am ready to pull the trigger ASAP! Nice to see another innovative product from Joe. I'll be one of the ten, thank you. Please pm payment information, and I'll reply with shipping address and so on. Im traveling internationally so please email me, more reliable. Thomas - I have no idea if it would fit your bumper. 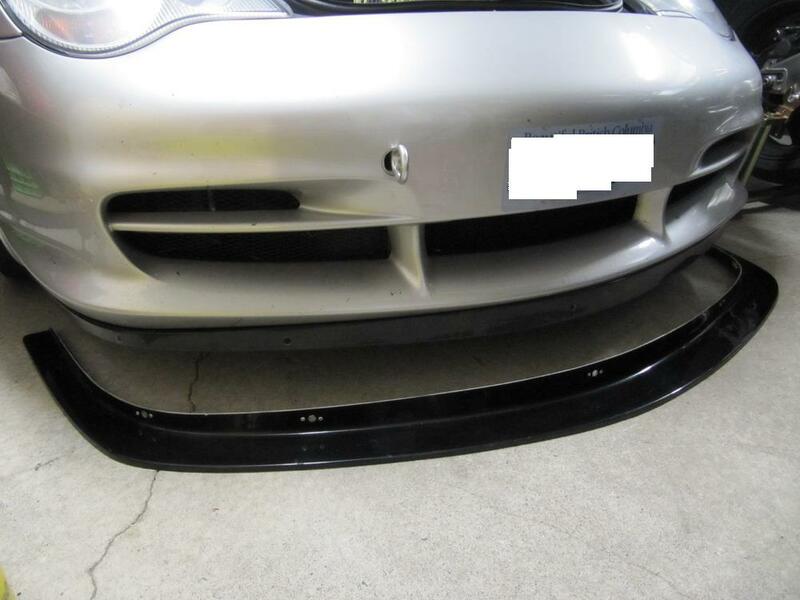 It was specifically molded to be an exact fit for a 2004 GT3 bumper, so you'd have to compare yours to that. Joe - just a quick update. I've been running the splitter now for 3 weeks (top half only on the streets). I've only once just barely scraped the bottom of the splitter on a steep driveway, no issues at all with regular driveways, speedbumps etc. It's a Jekyll & Hyde splitter - looks and functions like stock with just the top piece, and completely transforms the look of the car with the bottom blade locked into place. Thanks again. I'm glad to see this was finally produced. Joe, if I still had my 6GT3 I would buy one. Congrats on producing a very useful product for the 6GT3. It's a Jekyll & Hyde splitter - looks and functions like stock with just the top piece, and completely transforms the look of the car with the bottom blade locked into place. Thanks again. 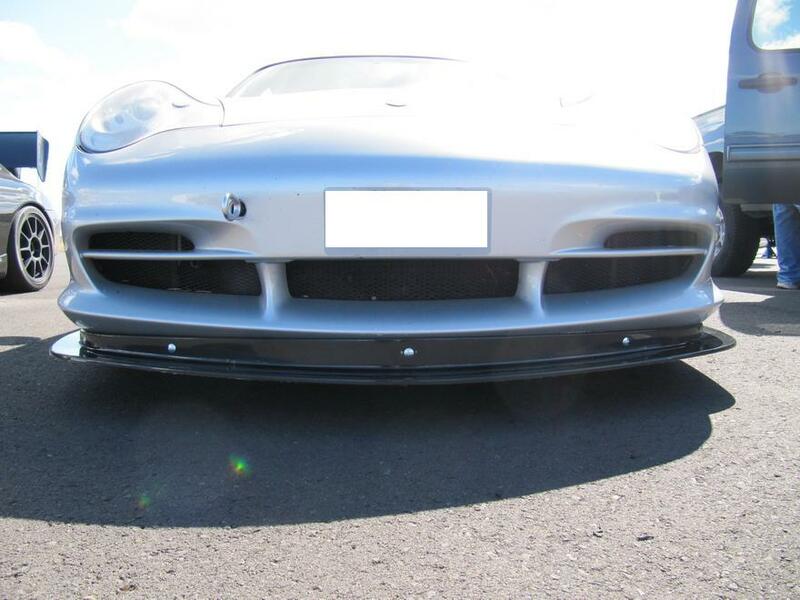 thanks again for helping get this done Ian - so are you saying you run the one piece on the road and then attached the more lippy/horizontally extended piece on the track? Yes that's correct. I included a couple photos earlier in the thread showing the top piece bolted to my bumper, and the lower blade sitting on the ground underneath. That's how I run the car for street use, with just that top piece. When I get to the track I attach the lower blade using the dzus fasteners provided by Joe. I really like how Joe designed the upper piece of the splitter, so that air cannot get between the splitter and the bumper. I used to think it was kinda goofy that I had to use electrical tape or duct tape along the leading edge of the Cup splitter to keep it from ripping off at high speed. so if it were permanently on a race car, would it be necessary to have 2 piece, or just the lippy one? ie can the big piece work w/o the top piece? aha .. just saw this ... "installing the lower splitter blade is accomplished with 7 Dzus fasteners. 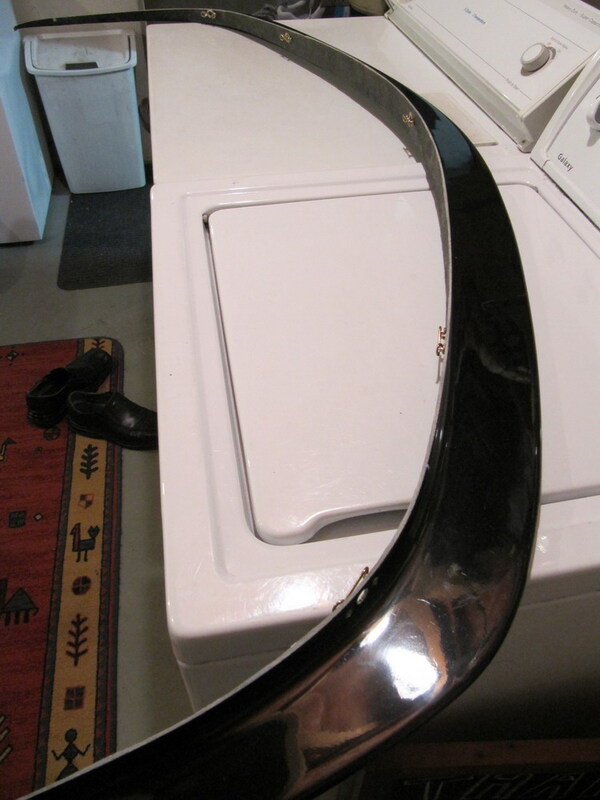 The bottom blade slides up and behind the top section, and takes a matter of seconds to install or remove. With the lower blade in place it turns into an aggressive and functional race splitter."" so it seems the top part is needed to secure the lower part .. and as you say better for trailers.